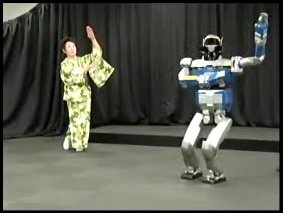 Using the HRP-2 Promet Humanoid, Japanese researchers, Shin’ichiro Nakaoka and fellow colleagues, have developed software that allows this 5ft (154cm) tall humanoid to imitate dance routines without falling on it’s [email protected]# via video motion capture technology. The HRP-2 “watches” a routine, then accurately reproduces it just minutes later. More details about it can be found in the International Journal of Robotics Research (please don’t ask us where:) ). Dr Nakaoka said: â€œThe result that the robot stably imitated human dance motions including dynamic-style step while keeping the original motion rhythm is a novel achievement for biped humanoid robots.â€?